WASHINGTON (AP) — Six times, President Barack Obama has come before the American people to reckon with the legacy of the 9/11 terrorist attacks on the anniversary of that awful day. Each time, he has tailored his message to the moment, at different points stressing themes of service, resilience, tolerance, reconciliation. 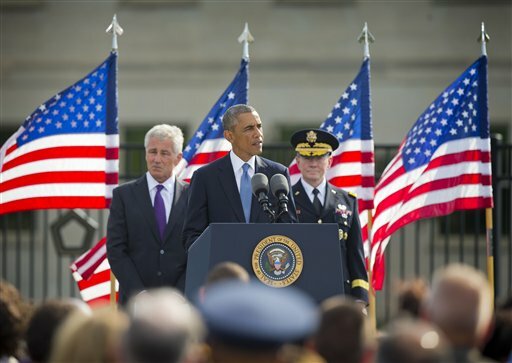 This year, with the threat of the Islamic State militant group looming, Obama’s rhetoric of remembrance is circling back to earlier days and striking a less triumphant tone. Even so, he offered reasons for optimism Thursday in brief remarks at the Pentagon’s 9/11 memorial. 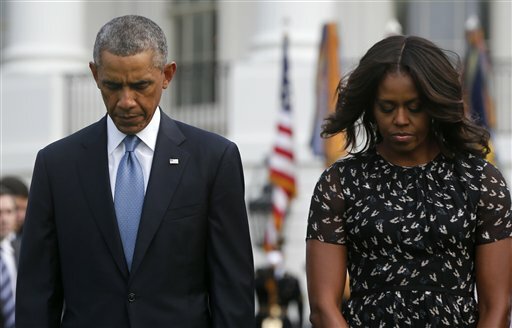 A few minutes before 9 a.m. EDT Thursday, Obama emerged from the White House with his wife, Michelle, and Vice President Joe Biden to observe a moment of silence marking the 13th anniversary of the terror attacks in New York, Shanksville, Pa., and at the Pentagon in suburban Arlington, Va., across the Potomac River. The Obamas planned to take part in a service project later in the day. Biden, for his part, joined a group of volunteers at midday helping to assemble care packages for first responders and U.S. troops. A look back at how Obama has framed his 9/11 message over the years. White House reporter Nedra Pickler contributed to this story.